It was a pleasure meeting the performing artists at their head office in Dubai and watching their rehearsals for the upcoming show. They are Salina Bakaou, born in Sweden with a Dutch and Tunisian background, Suhail Khoury from Jordan, Javier Rendón and Joan Nicolas Benavides Garcia from Columbia. They strongly believe that through art they can leave the world in a better shape than they found it. – When I left my home country, Jordan, I went to Egypt for the next four years, to the Sinai desert, teaching Bedouin children of the Tarabin tribe English, math, philosophy and performing arts. This was an amazing experience and I learned a lot. I left Egypt, because I met a beautiful woman who shared an opportunity in Dubai, so I moved to the UAE. That was four years ago. What inspired you and your brother Zaid to create the artist platform Soul Artists? – The idea came to me 2 years ago, when I had become tired of the corporate lifestyle, with a job that demanded too many working hours and gave too little pay. I sat down with myself and asked – what would I love to do, if money wouldn’t be an issue? The answer came almost immediately – that I would love to perform magic and similar performing arts. Naturally, I went online to find where I can share my content, skills, experience and get hired. The search results, however, were very vague and there was no direct solution for an artist to post what he is doing for the world, to be seen and get jobs. Immediately, I felt that this was my calling, to create a platform where any artist can have the space to express what he or she is doing and to get booked in a fast, easy, secure and reliable way. My brother Zaid supported the idea instantly and we started to work passionately on that venture and continue doing so to this day. You travel around the globe to perform your shows and you said a nice sentence: ‘We met each other through each other’. What are you specialised in when performing on stage? Suhail: – Being an artist is a lifestyle. I specialise in performing close-up magic, which is the discipline of performing sleight of hand in the immediate vicinity of the audience, interacting directly with the spectators and performing the illusion right under their noses. Amongst others, I love doing cardistry – the art of card juggling – which is card manipulation in a fast, aerial and acrobatic fashion to produce movement art with cards. For Flow Arts, I specialise in Poi spinning. Poi is a dancing prop that uses lights or fire attached to a chain that is manipulable through dance and body movements. The body movements for me are highly inspired by martial arts, creating a beautiful spectacle of fire and light for the audience. Salina: I love dancing with multiple rings and hula hoops, combined with acrobatics and Acroyoga disciplines, giving the audience an amazing visual experience of flexibility, body coordination, fire, light and contemporary dance. 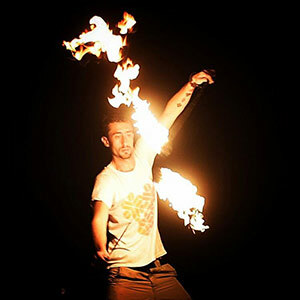 Javier: – I’m a multi-skilled artist using the techniques Object manipulation/ Hand to hand acrobatics and Acrosport or Acro dance as well as fire-spinning and riding the unicycle. I’m a circus artist. Nicolas: I do unicycle performances, juggling, object manipulation with clubs and crystal balls, Poi, I balance objects and more. My act is a fusion of all these disciplines, creating a visual experience of multi-object control mixed with body movements and riding the unicycle. What inspires you and how do your ideas for performances come to life? Suhail: – I get my ideas from professional dancers, mainly from the art of ballet and contemporary dance, as well as from martial artists and their body movements. When performing as magician, I want the performance to be accessible to everyone, to give the audience something unexpected as childlike wonder, so that the spectator can forget the outside world for some moments and open the mind to new possibilities using his or her imagination. Javier: – I’m inspired by real life and social problems in society, by questions like ‘How can I convince a child to read?’ or ‘How can I convince someone to eat properly?’. I want the audience to feel inspired by our art and while creating and producing it, I ask myself those questions. When I have a clear idea about the topic I explored, I start creating the performance – number of artists, light, music, colours, costumes, etc. Who is my audience? What is my space? Where do I perform? Artists through history influenced people, we want to do it in a positive way. To create a proper show, you have to prepare at least 6 months, rehearse 5 days a week for 6 to 8 hours a day, with up to 50 people involved in that process, which means artists and crew. For example, we have rehearsal times for different classes to create one show with the group, like theatre classes, dance, yoga, anatomy and physiology classes … People see one show, but they never see the hundreds of hours put into it. Nicolas: – I get inspired by watching documentaries, reading books, by people, life … Each of us has his own way of seeing things. When we come together, we share our ideas, discuss them and the inspiration flows. Salina: – Music inspires me the most. Moving in different ways while listening to different genres, makes me move, constantly exploring the body capable of moving and observing how it can evolve. Salina: – We are participating in the European Juggling Convention EJC in the Azores. This is so exciting, looking forward to it! If you could pick only one word to describe our relation, which word would you choose?